These 100% natural bamboo cleansing cloths are formulated to cleanse, condition and brighten skin any time, anywhere. Conveniently packaged, these extra large cloths are soaked with anti-aging and antioxidant botanicals like grape seed extract, ginseng and chamomile to leave skin feeling soft and hydrated while gently cleansing to reveal a brighter, cleaner, more radiant complexion. These cloths are makeup artist recommended and are formulated to cleanse well and remove light makeup. 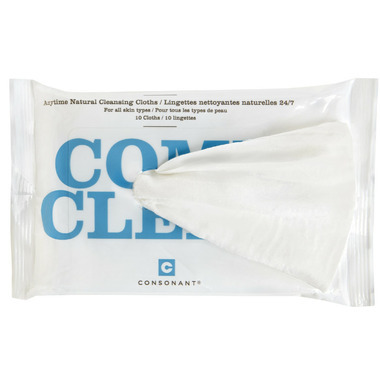 For waterproof mascara you may wish to follow with a pump of Consonant Natural Foaming Face Wash.
Each pack contains 10 wipes to ensure freshness and ultimate portability! 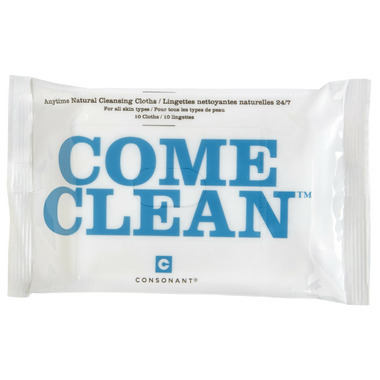 I prefer the cleanser. I use it only if I wear a lot of make for a special event, and finish with the cleanser because it leaves a kind of greasy finish. The wipes are big enough. These worked pretty well to remove my makeup, with the exception of waterproof mascara. I found it was often necessary to use two wipes to completely clean my face I was wearing more than my basic light makeup routine, but to be fair this is usually the case with most makeup removal wipes. This product didnâ€™t irritate my skin or eyes and didnâ€™t seem to leave any residue. I would buy these again, especially for when traveling. AMAZING. A fiver star product.